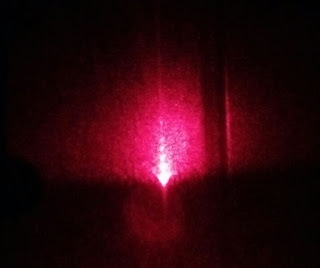 In this attempt to reproduce the Lloyd's Mirror experiment done in 1834 a red laser was used. The laser beam at a small angle hit the face of a mirror that was parallel to the ground and perpendicular to the wall where the image was formed. The image consists of a bright column in the center formed by triangle-like spots stacked one after the other. Around the central column small dark lines parallel to each other can be seen crossing the red interference background.